reminds me a lot of Ralph Steadman's work. Hee hee. And the funny part is that it's in 'black and white', just like the little world the Reverend Wright lives in. 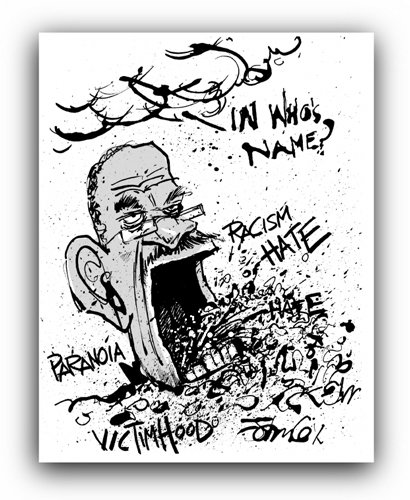 The Reverend Wright, the gift that keeps on giving. Just like herpes. Big Ralph Steadman fan. I find that style of work very liberating.....and angry. Although it looks similar to Steadman, it's a little more clear to me. Yet another cruel hoax perpetrated by the man to keep the brother down. some may say Steadman, though Gerald Scarfe first came to mind. Has anybody noticed that the easiest ways to make monay on this earth is to be a democratic politician (republican politicians generally already have money) or a televangelist? I'll have to consult with the Reverend Doctor Bill Gates & the Honorable Warren Buffet on that. I'll go along with your premise if we can add to "the easiest way to make money"..."for charismatic, opportunistic, amoral shysters with no conscience." That should have been "the Honorable Prophet Warren Buffet." Don't know why the rich always feel guilty about having money. Heck, they can send some to me, I won't mind. Anyone got Warren's address? This page contains a single entry from the blog posted on April 29, 2008 6:18 PM. The previous post in this blog was THIS, TOO, SHALL PASS. The next post in this blog is GRACELAND.